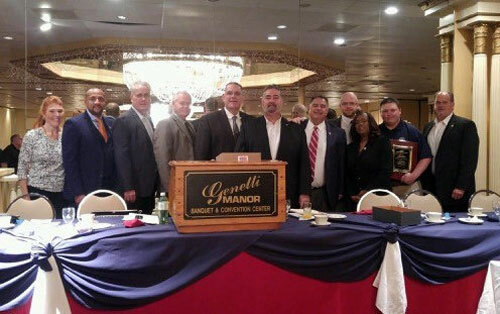 From left: District 1 Office Manager/Secretary-Treasurer Wendy Santora, Legislative Director Hasan Solomon, District 1 Business Representative Brian Mulhern, Eastern Territory Chief of Staff James Smith, District 1 Directing Business Representative Tony Armideo, International President Bob Martinez, Eastern Territory General Vice President James Conigliaro, District 1 Assistant Directing Business Representative Bill McIntosh, General Vice President Diane Babineaux, Local 321 Chief Steward James Myers and Headquarters General Vice President Rickey Wallace. In addition to being a fundraiser, the dinner is also way for the district to thank Stewards and Officers for their hard work and dedication to their union. The district also picks a deserving person from the ranks of stewards and local offices to receive the District Man of the Year Award. This year’s honoree was the Local 321 member James Myers, the Chief Steward from Bowhead at Letterkenney Army Depot.